Now you know, where do you go? I'm talking about gluten.... have you been diagnosed, or only believe you are gluten-sensitive after a lot of trial and error? Either way, there is a great opportunity coming right up that will help you get healthy. What tests should I take to see if I have a disorder? Could it be gluten? Or dairy? Or another food triggering symptoms? How do I order tests? What if I’m outside of the U.S.? What if my results come back positive for a gluten-related disorder? Do I really need to take nutrition? If so, for how long? Okay, I have no real proof that Texans are more at risk for gluten-sensitivity than anybody else. But there is plenty of proof that gluten-sensitivity is on the rise in the U.S. Having just attended The Gluten Summit, I know now that there is proof that GMOs destroy our gut lining via the pesticides we ingest, and without a gut lining, the offending gliadin protein from wheat gets free access to our bloodstream where it’s routed through our bodies and ultimately produces disease in the brain, joints, heart or wherever you happen to have a weak genetic link. In addition to the reporting in the summit, this information was recently presented formally in a research paper entitled “GMOs Linked to Exploding Gluten Sensitivity Epidemic,“ authored by several leading researchers including Sayer Ji of GreenMedInfo and Jeffrey Smith of the Institute for Responsible Technology (IRT). To reiterate, a growing body of evidence points to the epidemic rise of gluten-sensitivity very shortly after the introduction of GMO corn and soy into the food supply in the early-to-mid 90s. Indeed, prior to Monsanto’s grand experiment, gluten sensitivity was unheard of by most medical practitioners outside of an extremely small population plagued by celiac disease. Many practitioners around the U.S. now estimate that a conservative 30% of their patients are hyper-reactive to gluten. Early experiments have shown that the rise in gluten-sensitivity is caused by an environmental trigger very likely to be the Bt toxin engineered into GMOs - along with glyphosate, the pesticide in Monsanto’s Round-Up which is directly applied to their GMO crops. Both of these toxins continue to kill micro-organisms after we ingest them, thereby destroying all the beneficial gut flora. These toxins quite literally poke holes in the gut and produce “leaky gut syndrome” which opens the door to myriad health problems. But why Texans are so affected? My theory is because of the typical Tex-Mex diet, one which I lived on for more years than I care to admit. We Texans eat a LOT of corn: breakfast taco on a corn tortilla, the corn chips with lunch at the local sandwich shop, the enchiladas rolled in corn tortillas for dinner. I well remember that the horrid stomach problems (which grew to be so much more) began in the mid 90s in my own family. But whether you are already symptomatic or not, every single person who consumes GMOs is a ticking time bomb since the destruction of the gut is not selective. The more GMOs you eat, the faster the damage is done, but it’s being done to ALL of us. Bottom line: Eating gluten-free is simply not enough to safeguard the health of people with gluten problems. Turns out that it’s absolutely vital to stop the GMOs too. And with Monsanto’s big bucks and Washington insiders at the helm of the FDA and USDA, it’s an uphill battle. Don’t trust anyone with your food supply. Eat local, eat organic. Know where your food comes from. Here it is Day 6 of the gluten summit - Today's program starts at 10 a.m. central time, but you can register anytime during the day today and listen to the last 3 days of presentations. I am learning soooooooooooooo much, far more science-based information (but explained in layman's terms) than I thought possible. 99% of your genes reside in the microbiome (microbes) of your gut. 2/3 of the immune system is in the digestive system. The latest research shows that gluten is OFTEN the cause of high blood pressure as well as abnormal lipid work (high cholesterol) leading to arteriosclerosis. The best diet you can eat contains healthy fats and lots of vegetables. There is a direct correlation between alzheimer's and other neurological diseases and the inability to digest gluten. There has been a 400% increase in the use of anti-depressants since GM crops have been introduced (anti-depressants are by far the most prescribed Rx in the 18-44 age group)... and yes this DOES relate directly to gluten sensitivity. Every expert that I've heard thus far into the summit has stated that gluten-intolerance is far more than just a gut disease. Most readers here surely already know that the Bt toxin in GM foods creates a pesticide factory that resides in your gut, destroying the lining and allowing toxins to enter the bloodstream... gluten is one of those toxins, and where it ends up is where you will have problems ... your joints, heart, brain, kidneys. The mechanism by which gluten causes disease is explained quite clearly in more than one of these interviews, making this summit absolutely invaluable. Another tidbit: those with identifiable antibodies to gluten are quite likely to have lost the ability to digest many other foods as well. Accurate testing is vital as is the proper lab that knows how to perform the tests. Colostrum can HEAL the gut, and peptides from colostrum can be used to "Balance" the immune system. "Balancing the immune system" is an important distinction from "stimulating the immune system" because some people have an over-active immune system with related problems and some have very weak immune systems. Humans have never developed the ability to digest gluten. For ~70% of the population, gluten can pass out of the gut in about 5 hours, but with today's heavily processed and wheat-heavy diet, there is no five hour window. Gluten accumulates and destroys the lining of the gut over time (aka "leaky gut syndrome"), leading to heart disease, brain disease, neurological diseases, not to mention the initial gut problems experienced by everyone in the early stages of gluten sensitivity. I cannot recommend this summit enough. Update: The live summit is now over, but you can purchase all 29 interviews in digital format for only $97 (the "professional" version with DVDs and reference material is $497) by going here. My apologies for the lack of attention to this blog for this entire month. Mexico turned out to be quite an adventure as it neared the end. Although we were in a safe spot, we were burglarized 4 days before departure. The ladron (thief) got my computer with my whole entire life on it (with no backup! I know, I know...) (including Sippie's Studio labels which took me forever to create!) as well as phone, cash, coat, and... o yea, a suitcase to put it all in. The good news is that nobody was home when it happened. And even better news is how we were helped by sooooo many wonderful Mexican people who even walked the streets on our behalf, going door to door in one neighborhood to try and find the culprit. Despite this unsavory ending to a great trip, I would go back in a heartbeat - and certainly will when I get the chance. Peel and wash the tomatillos. They tend to be sticky once the peel is off so you might want to soak them awhile, then rub the skins to eliminate that stickiness Cover with fresh water, add a dash of salt, and heat to boiling (about 15-20 minutes). Meanshile, place your pepper(s) whole down on a hot griddle and broil til the color starts to change. 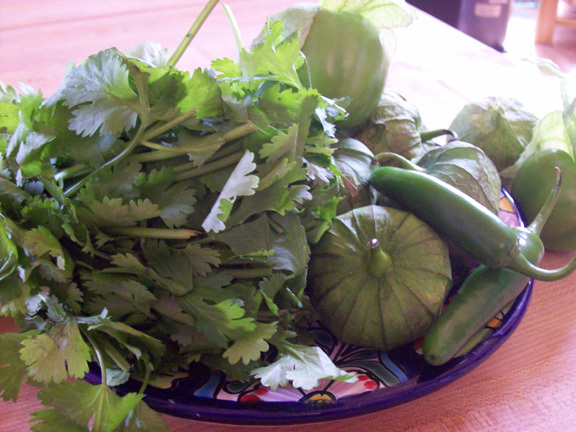 Chop it in half or quarters along with the garlic and place both in a blender with salt, oil, and cilantro. (You might have to add a little water to get your blender to grab them all, but no harm done, as some people dilute their salsa at the end anyway.) Pulse these ingredients until liquid, then add the cooked tomatillos and pulse again until all is liquified. It will be slightly thick, and you can add as much water, as much salt and/or hot pepper to taste at this point. This salsa will keep in the fridge for at least 4-5 days, and I find myself pulling it out for everything from huevos rancheros to spicy dip for chips. Note: I've found that back in the States the peppers are not as hot as in Mexico so I'm using a whole pepper and still not getting a super picante HOT sauce. Maybe that's a good thing as I'm back in gringolandia where we gringos shy away from the burn. This salsa will now be featured at Thursday night taco night at Cenote on occasion. The gluten free bakery is not totally closed while I escape Austin's cedar fever this year. You should still be able to find gluten free blueberry muffins, oatmeal-raisin and chocolate chip cookies provided by my right-hand man, Spice Bakerman. Additionally, Misty Morning Bakery is well represented at Cenote as well. Their gluten-free breads are especially delicious and are available as a gluten-free option for every sandwich from Cenote's kitchen. I wish I could say that I really miss Austin right now, but ... well, that would be a lie. Guanajuato has never been more beautiful, especially this year with temps in the high 70s in the day and down to low 40s at night. Perfect weather here (so sorry if it sounds like I'm rubbing it in! ), but we all need a little 'vacaciones' now and then. Hasta febrero! End of year update: This seems a good time to update anyone interested on the progress, or lack thereof, of the garden at Cenote. If you've ventured over to have a look, all you'll see is a bunch of dirt and leaves in the four raised beds, not a leafy green to be found. Though we planted our garden at home on the very same day as Cenote's gardens with the very same seed and were eating fresh lettuce out of it about four weeks later, Cenote's plants never got bigger than sprouts! The difference? SOIL! I will not name the vendor who supplied the soil but suffice it to say, the soil was not what it was cracked up to be. Not even close since it actually contained the word "compost" in the name of the mix. Sadly, this was not compost. We've resigned ourselves to the fact that for this season, we are building soil only, providing it with coffee grounds and cardboard (carbon and nitrogen) in the hope of creating true compost in which to plant when February (next planting time) rolls around. Finally, at the end of each year I try to stop and make note of the things that I tend to take for granted. Gratitude time: I am so so so grateful for all the new young friends I've made at Cenote this year. Here I am in the autumn of my years (early autumn I hope), and I'm surrounded by all these incredible young souls. I'm so grateful to have had the chance to get to know them all this year. Best present ever. Shannon and Alton, all smiles! Congratulations to Cenote for winning the Austin Chronicle's Best New Coffee Shop category for 2012! Needless to say, it came as no surprise to me since I'm up there all the time and see just how incredibly special this place is. From Chino's handmade kitchen delights with daily specials made with local garden produce - to the historic building saved from the developers' wrecking ball and renovated into the most unique and beautiful shop anywhere to be found (they received an award for historical renovation) - to the absolutely incredible staff, all of whom I have come to adore very much.... Cenote is truly a very special place. And speaking of staff, a few special people are pictured here. Some were experts in all things coffee already, having served up coffee in Austin for several years before Cenote was a twinkle in Cody's and Mary's eyes -- I'm thinking specifically of Shannon here who is pictured above with Alton Jenkins, Cenote drummer-in-residence who takes and delivers your order with the best smile on the planet. Zac Collier whipping up a latte. Many more people to mention here, and I'll get around to posting more of their photos soon. Needless to say, they're all very special folks. I love these people!! Sometimes you just get a feeling inside that things aren’t what they seem. Such was the case with me when a friend invited me onto Kiva, the online microfinance website that promotes itself as bringing real connection between borrower and lender. It sounds so good, so easy - just loan $25 or more directly to a needy person of my choosing whose pictures are provided along with select personal data. Kiva’s website tells you that it works with ‘organizations in the field’ to actually disburse my loan and that I will get all of my money back (without interest) when the loan is repaid by the new friend I have made -- who is ever-so-grateful that I have chosen him/her as the recipient of my loan. And in case you’re unfamiliar with microfinance, in a nutshell it’s a way of providing loans to poor people so they can lift themselves up out of poverty. Sometimes this means a loan to purchase goods to re-sell, sometimes a sewing machine to help increase a hand-sewer’s productivity, sometimes a couple of goats so a small farmer can sell goat milk in their community. It all sounds very simple -- the loans are usually repaid within a matter of months, all scheduled and carefully monitored by the non-profit lending institution in the field (meaning the partner institution located in the country where the loan is made). I need to back up a bit here and say that my interest in this issue became personal years ago when a friend fresh out of college set up a non-profit microfinance institution (MFI) and asked me to donate (please notice that my friend’s org depends on donations, not loans, which makes its operating model different from most of the other players). Knowing this friend has a heart of gold, I didn’t hesitate and have followed the growth of my friend’s org from a one-person show involving repeated trips to one of the poorest spots on the planet to disburse donated funds to what is now a large, well-funded (donations, interest, and loan repayments) organization with celebrity supporters and fancy parties. My friend’s involvement has dwindled to that of adviser after holding every position imaginable over the years, and financial ‘experts’ make up a board of directors who are set "to guide the organization to the forefront of microfinance." Uh... wait a minute. Where’s the part on the website that tells me what sort of interest rate they are charging these people? Additionally, they say there’s a “savings component” that requires each borrower to place funds in the care of this microfinance organization, ostensibly as collateral that will earn interest for these poor people. But how much funds/savings are they required to deposit? And how much interest do the borrowers earn on this savings account? How much interest does the org earn while they’re keeping it safe for them? I’m not seeing transparency here, and that makes me nervous. And then recently I got this invite to become a lender through Kiva, an MFI based in California with a novel means to attract capital via a website ... I perused the website for answers to the same types of questions. Nothing specific (to be fair, they do post the “average” interest rate used by their many partners in the field), but plenty of photos of poor people smiling with names and locations and types of businesses they want to promote. Bingo. I have an emotional connection! And the invite said that I wouldn’t even have to loan my OWN money because some anonymous donor wants to promote Kiva by giving money to people like me so I can learn about Kiva and become a lender in my own right. Whew, how philanthropic of Anonymous! 1) In 2009 a Kiva website user discovered 2 photos of the same poor person on different pages of the Kiva website where they were given different names and profiles. One photo was cropped slightly different than the other, and they were time-stamped only one minute apart. 2) Despite all sorts of evidence of fraud and direct notification of that fraud to investors, large pension funds (yours perhaps?) continue to invest in a Nigerian MFI known as LAPO that charges up to 150% interest (even more on occasion) on loans to the poor in that country. Why would these large 1st world pension funds continue to support such blatant misuse of pensioners' dollars? Because LAPO successfully repays the investor loans at a high interest rate. And of course, it’s not really about the poor at all. As you might guess, some of these MFIs collect debts by threatening their debtors. One debtor sold her child into prostitution in order to pay up. And a rash of suicides by borrowers in India made headlines. 3) Due to a clause in microfinance regulations, the same fraudulent Nigerian fund recently employed an option called “transformation” that allowed it to (presto!) become a bank and disburse a percentage of their holdings to the CEO and shareholders. This option is open and available to any MFI that wants to go there. 5) In 2010 Kiva held $42 million in idle cash (money waiting to be loaned or returned), none of which belongs to Kiva but from which Kiva earns a very tidy interest income for itself. Much of that money comes from Wal-Mart ($1million), Microsoft ($65,729), Visa ($1million), Google ($58,303) (figures from 2007), and from people like me who gave $4,850,507 in 2010. Though it’s still relatively unpopular to criticize microlending, the NY Times has done it, and more and more whistleblowers like Sinclair are stepping forward. By reviewing Sinclair’s book (which is thoroughly documented in the bibliography, btw) I’m effectively adding my voice to the fray. Next time I travel to a third world country, I will look for a real person who could perhaps use a hand up and offer her/him mine - up close and in person. * Build a register of neighborhood tools and equipment (such as lawnmowers, clippers, hammers, saws) that neighbors are willing to share. Operate it as a library so you'll be able to keep track of who has what checked out at any given time so the next person who needs something will know where to go look. * my favorite: Somewhere near the street, place a little covered/waterproof box on a pole at eye level (i.e. something like an extra mailbox) for a book and magazine exchange. When someone walks by, they can take one, leave one at will. Great way to share books you love or magazines that might be of interest to someone else before they're recycled. Of course these ideas will only work if your neighbors are kind and like-minded enough not to sneer at you for even proposing such things. I do think there are plenty of places that are ripe for this. I'd love to hear from anybody that has other ideas OR anybody who is already doing some of these. Let me know.